Renri (人日, literally Human Day) refers specially to the 7th day of zhengyue (正月, the first month in the Chinese calendar). According to Chinese customs, renri was the day of creation of human beings. It is celebrated not only in China, but also other regions influenced by Chinese culture. In Chinese myths, nüwa (女媧) is the godness who created the world. She created the animals on different days, and human beings on the seventh day after the creation of the world. Step 1 : All at the table offer New Year greetings. Say: 恭喜发财 “Gong Xi Fa Cai” meaning “Congratulations for your wealth” or 万事如意 “Wan shi ru yi” meaning To Be Smooth Sailing. Say 年年有馀 "Nian Nian You Yu"
Say 大吉大利 "Da Ji Da Li"
Step 4: Pepper & Cinnamon Powder spread over the ingredients hoping to attract wealth and treasures. Say 招财进宝 "Zhao Cai Jin Bao"
Say 一本万利 "Yi Ben Wan Li and 财原广进 "Cai Yuan Guang Jin"
Step 6: Carrots are added, indicating blessings of good luck. Say 鸿运当头"Hong Yun Dang Tou". Step 7: Then the shredded greens is placed, symbolising eternal youth aka forever young. Say 青春长驻 "Qing Chun Chang Zhu"
Step 8: The shredded white radish is added, meaning reaching a level higher in each step - prosperity in business and promotion at work. Say 风生水起 "Feng sheng shui qi" and 步步高升 "Bu Bu Gao Sheng"
Step 9: Chopped Peanut bits represents eternal youth and also they are an icon of longevity. Not only that they are spreaded on the dish symbolizing a household filled with gold and silver. Say 金银满屋 "Jin Yin Man Wu"
Step 10: Sesame seeds quickly follow symbolizing a flourishing business. Say 生意兴隆 "Sheng Yi Xing Long". Step 11: Followed by deep-fried flour crisps in the shape of golden pillows that literally means the whole floor would be filled with gold. Say 遍地黄金 "Bian Di Huang Jin". Step 12: Start tossing the salad in an auspicious 7 times with loud shouts of “Lo Hei” 捞起 and other auspicious New Year wishes. 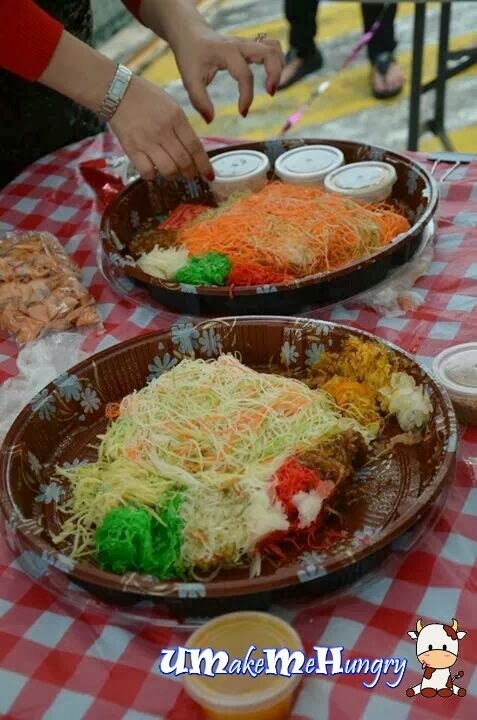 Say Lo hei 捞起 which is Cantonese for “Tossing Luck”. 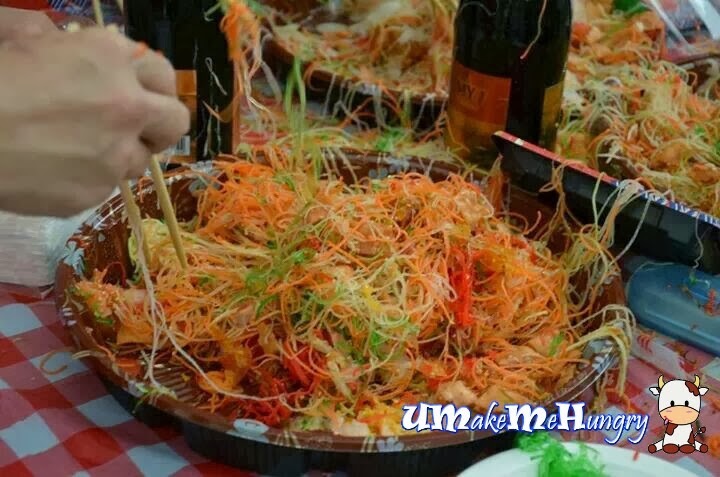 UMakeMeHungry Wishes you a Huat Huat Year!